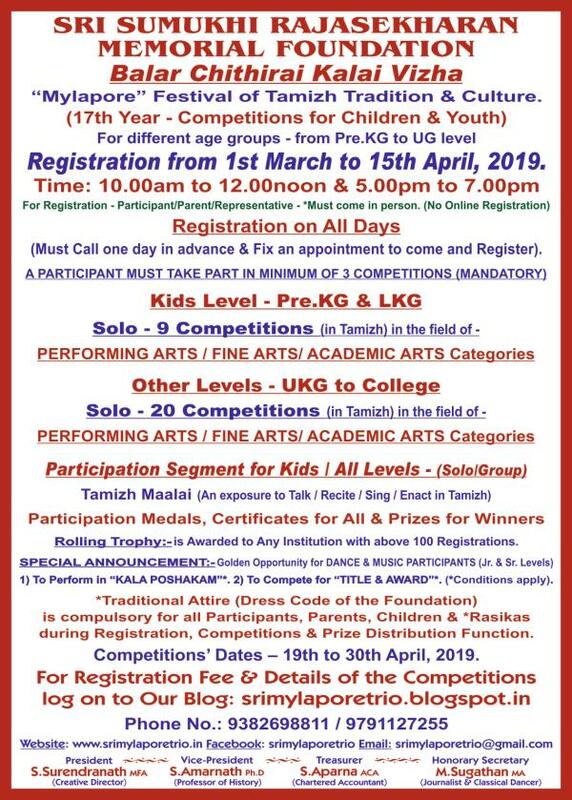 Contest for KIDS, CHILDREN & YOUTH of CHENNAI. (17th Year “Mylapore” Festival of Tamizh Tradition & Culture – 2019). Kids Section: – Pre.KG, LKG. Sub. Junior: – Sec. A – UKG, I Std. & Sec. B – II, III Std. Junior: – Sec. A – IV, V Std. & Sec. B – VI, VII Std. Senior: – Sec. A – VIII, IX, X, XI Std. & Sec. B – XII to UG (College). Kids Level – 9 Competitions in the field of Performing Arts, Fine Arts & Academic Arts. Other Levels – 20 Competitions in the field of Performing Arts, Fine Arts & Academic Arts. A PARTICIPANT MUST TAKE PART IN MINIMUM OF 3 COMPETITIONS (MANDATORY). Registrations from 1st March to 15th April, 2019, at Foundation Premises. (Must Call one day in advance & Fix an appointment to come and Register). Working Hours: 10.00am to 12.00noon & 5.00pm to 7.00pm. Foundation Dress Code Mandatory during Registration for All Participants, Parents, Representatives.